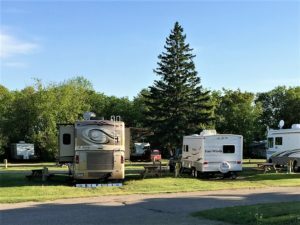 With 66 sites, including back-in and pull-through sites, Meadowlark Campground & RV Park is the largest campground within Brandon city limits. Both 30-amp and 50-amp service is available. The campground is conveniently located along the Trans Canada Highway and features easy access. Big rigs welcome! We have all the amenities you’d expect from a full-service campground, including UPGRADED FREE WiFi, FREE showers, laundry facilities, a convenience store, and playground and Dump Station. A variety of dining options—both national chains and local eateries—are located nearby, and more are just minutes away in the city center. For an enjoyable camping experience to spend a day, week, or more, choose Meadowlark Campground & RV Park. Conveniently located on the Trans Canada Highway #1, between the 1st Street and 18th Street exits at Brandon, Manitoba.